The Halberd as it appears in Smash. The Halberd (戦艦ハルバード, Battleship Halberd) is a Kirby stage introduced in Super Smash Bros. Brawl and returning in Super Smash Bros. for Wii U and Super Smash Bros. Ultimate as a familiar stage. 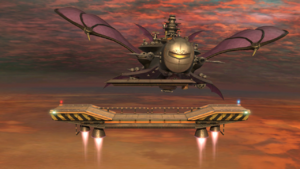 It is Meta Knight's airship featured in Kirby Super Star, used for combat. It was first unveiled at E3 2006. In Ultimate, Meta Knight is fought here for his unlock battle. The stage begins in a hangar, which then opens up, letting Meta Knight's airship take off. Any players still on the floor of the hangar at this time will be KO'd, as the takeoff speedily drops the hangar through the bottom blast line. A platform rises from the center, taking the characters with it. It then proceeds to float around in the sky, with the Halberd flying in the background. One minute into the match, the platform lands on the Halberd itself, in front of the Combo Cannon, a boss from Kirby Super Star that interferes by locking on to one player and shooting a blast of energy, by extending its arm to swipe at the players, and shooting powerful cannon balls, which is similar to how it attacked in the aforementioned original game. The platform then rises above the ship, and returns to the bridge later again. The process repeats until the match ends. In Super Smash Bros. for Wii U, the Ω form features a flat platform with similar designs to the normal platform which orbits around the Halberd. Characters can no longer pass through the platform from below. The shipyard is never seen as the platform starts in midair and never lands on the deck of the ship. Star KOs may occur. In Super Smash Bros. Ultimate, the Ω form and Battlefield form are set on a similar platform to SSB4's Ω form that is resized and reshaped to match Final Destination and Battlefield, respectively. The three soft platforms of the Battlefield form resemble the soft platform of the normal form. The Halberd in flight, as seen in Kirby Super Star. This stage is from Kirby Super Star. In the sub-game Revenge of Meta Knight, Meta Knight attempts to take over Dream Land using an airship known as the Halberd. In order to stop Meta Knight, Kirby must infiltrate the airship and destroy it from the inside. The Halberd in Smash is loosely based on its appearance in Super Star, though it has a more streamlined design, which would become the basis of its design in later Kirby games. At the beginning of Revenge of Meta Knight, a cutscene is shown that depicts the Halberd flying out of a hangar, similarly to the beginning of this stage. The cutscene also depicts the Halberd flying over the ocean at sunset, which serves as the basis for the stage's backdrop. As Kirby is destroying the Halberd, he comes across the ship's main artillery, the Combo Cannon. As its name implies, the Combo Cannon has two barrels: one that fires cannonballs, and another that fires lasers. It also has an arm that will try to grab Kirby. In this stage, the main platform lands in front of the Combo Cannon. The Combo Cannon has retained its ability to fire cannonballs and lasers, but the arm does not grab players as it did in Revenge of Meta Knight; rather, it will extend and damage players. This stage is usually a counterpick in most tournaments, because while the Combo Cannon's weapons are generally easy to see coming and have strategic merit, they have extreme power and can turn around a match with no effort by the opponent. The unusually low ceiling also gives an advantage to characters whose best KO moves deliver vertical knockback, such as Fox, Snake, and King Dedede. Fittingly, however, Meta Knight also gains a significant advantage here, as the main platform of the Halberd allows sharking underneath the stage, occasionally leading to the stage being banned from tournaments. Halberd was once again included in major rulesets as a counterpick in the early stages of the Smash 4 metagame. However, the unusually low ceiling and sharkable main platform were still present, and more characters other than Meta Knight gained an advantage over other characters without good vertical finishers or aerial mobility. Coupled with the stage hazards being able to be taken advantage of, Halberd has been banned in major rulesets since MLG World Finals 2015. The Combo Cannon is a weapon onboard the Halberd. It comes with a beam cannon, a cannon that shoots cannonballs, and a large mechanical arm. It's a boss in the Revenge of Meta Knight chapter of Kirby Super Star and Kirby Super Star Ultra, the latter of which renamed the cannon "Main Cannon #2." The Combo Cannon is one of the main hazards of the Halberd stage in Brawl. Unlike in the original game and its trophy description, the arm doesn't hold on to players, but instead collides with them, doing damage and knockback. In the Subspace Emissary, the Combo Cannon can be seen fighting against Fox's Arwing twice, until it was eventually destroyed. The arm also held the Great Fox as the Halberd crashed it into the Glacial Peak. The Combo Cannon trophy in Brawl. The main gun of the battleship Halberd. As the name references, it has two guns--the top one shoots out slow-moving shells, and the bottom one fires a powerful laser. There's a mechanical arm at the base that is used to grab enemies and hold them to be blasted by the laser cannon. It has a wide attack range and once shot down Dyna Blade after she aided Kirby. The Combo Cannon trophy in for 3DS. The Halberd flying in the World of Trophies. The Halberd is being commandeered as the mother ship for the Subspace Army during the story. It also engages Fox in an Arwing twice and the Great Fox once. In all these cases the Halberd was too much for its attackers. It is used to drop off Shadow Bugs. While under the control of the Subspace Army, it is piloted by a group of Shadow Bug duplicates of Mr. Game & Watch, which afterwards coalesce into Duon. Near the end of the story, Meta Knight regains control of the ship and picks up the other protagonists. The ship is later destroyed when it attempts a direct assault on the Subspace Gunship. Despite this, it still appears in The Great Maze. It was later revealed in a post on the Smash Bros DOJO website that at some point prior to the start of the game, the Subspace Army stormed the Halberd and captured it. During the fight, Meta Knight was distracted by King Dedede, which allowed the Subspace Army to steal the ship. It is during this incident that King Dedede learns of Tabuu's true motivations. This is what prompts him to construct the Dedede Brooches later. According to the DOJO post, this was originally supposed to be shown in a cinematic, but the scene had to be cut due to time constraints. The Halberd trophy in Brawl. Meta Knight's battleship, built to help Meta Knight take control of Dream Land. It is crewed by Meta Knight and the Meta-Knights and is equipped with the Combo Cannon and a shrimplike robot called the Heavy Lobster. Kirby destroys the ship's reactor, causing the Wheelies who power the ship to flee. In the Subspace Emissary, the Halberd released Shadow Bugs, which formed Primids, and caused terrible trouble for our heroes. The Halberd trophy in for 3DS. There is a glitch on this stage that involves going "inside" the solid platform on the second portion of the stage (when the flying platform lands on the front of the ship). It is mainly a stalling technique, and it can be performed using Drill Rush or Aether. It is possible to jump back out, or get hit by an attack that knocks the staller up far enough. This technique is obviously heavily discouraged in competitive play, though the large difficulty of performing it and it being extremely situational makes it a pretty minor problem, along with the fact that it can only be done until the stage moves on from that portion. The beginning of the stage in Brawl. Characters on the flying platform as it approaches the Halberd. The Combo Cannon as it appears in Sea of Clouds. The Halberd in flight in Super Smash Bros. for Wii U.
Meta Knight flying alongside the Halberd. Meta Knight standing on the soft platform. Piranha Plant shooting a Spiky Ball at Chrom on the stage. This is the only "moving" stage that does not return to its original location. The Halberd, Pirate Ship, Luigi's Mansion, and Corneria are the only stages in Brawl to have their own trophies. The Halberd and Combo Cannon trophies only appear in the 3DS version of SSB4 despite the fact that they only appear otherwise in the Wii U version of SSB4. If the laser targets a character that uses the Dragoon, the crosshairs strangely move towards the screen until not visible. The Halberd's 3D model from Brawl is used in the CG cutscenes of Kirby Super Star Ultra for the Nintendo DS. Interestingly, the model is not properly rigged, so the extending arm of the Combo Cannon appears in its bind pose. This is the only non-Super Smash Bros. stage that is always guaranteed to appear in Brawl's Classic Mode; it will always be fought on for stage 5, as the Kirby universe is the stage's sole universe, and Halberd is the only legitimate Kirby stage usable for Classic Mode itself (since Green Greens is a Melee stage, it will never appear as with other Melee stages). 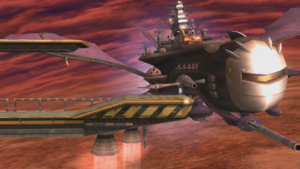 The Halberd's appearance in this stage is similar to how it initially appears in the Subspace Emissary - It is surrounded by dark red clouds, and odd sounds emanate from it on occasion. When the laser is being aimed in Brawl, one can see Meta Knight's insignia at each of the four corners after it locks on to a player. In addition, the 'W' on the 'Warning' sign at the beginning of the stage is an upside-down Meta Knight insignia. This page was last edited on April 16, 2019, at 08:13.